BALTIMORE (AP) — Understanding that 27 carries a game is way too dangerous for an NFL quarterback, Lamar Jackson may do things differently in his second NFL start Sunday. 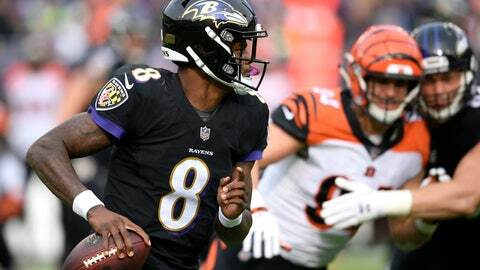 Playing in place of the injured Joe Flacco last week, the former Louisville star slithered, juked and bulled his way for 117 yards rushing to lead the Baltimore Ravens past the Cincinnati Bengals 24-21. Or perhaps the rookie will decide that passing might be the way to go when the Ravens (5-5) face the Oakland Raiders (2-8). With Flacco out with a sore right hip for at least one more week, Jackson hopes to utilize both his feet and right arm when operating the run-pass option that has suddenly become a staple of the Baltimore offense. With Jackson and rookie running back Gus Edwards (115 yards rushing) leading the way, the Ravens snapped a three-game skid and got back in the playoff hunt. The Raiders ended a five-game losing streak against Arizona last week, and quarterback Derek Carr wants to keep the momentum going. There haven’t been many positives for Gruden in his first season back in charge of the Raiders, but the play of running back Jalen Richard has been one of them. Richard leads the team with 51 catches this season and has been counted on as a runner more after Marshawn Lynch went on IR with a groin injury last month. Gruden called Richard the team’s MVP so far. Combining speed and strength, Edwards, an undrafted free agent, burst onto the scene last week with a huge performance. Seventh-round receiver Marcell Ateman fared well in his debut for Oakland last week, catching four passes for 50 yards, including a 32-yarder on the game-winning drive. Ateman got his first chance because of injuries to Martavis Bryant and Jordy Nelson. Nelson might be back this week, but Brandon LaFell is out for the season with an Achilles injury — meaning the Raiders will need more from Ateman again. Jackson’s propensity to run means fewer catches for Baltimore receivers, but with they’ll gladly trade receptions for wins. Michael Crabtree was Carr’s most trusted receiver during their three years together in Oakland. Whenever Carr needed to find someone for a key first down or touchdown, Crabtree was usually the player he looked to first. Crabtree’s 217 catches and 24 TDs on passes from Carr are the most of anyone. The Raiders released Crabtree in March and he signed with Baltimore, where he has 42 catches for 479 yards this season. Crabtree expressed no desire to extract revenge against his former team.